A spur of the moment trip to Southampton to find an Indian restaurant produced no results. 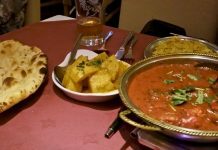 Now we know that Southampton has many Indian restaurants but if you don’t know your way around it all goes ‘pear-shaped’ pretty fast, we gave up and headed to Romsey instead. Southampton will have to wait another day. Romsey is a small town with a close-knit community and easy to find your way around. I have never been there in the daytime so I couldn’t tell if there was any kind of sights or activities. We saw a few pubs and a couple of restaurants that looked reasonable in price and ambience but decided to walk around a bit more. It paid off quite nicely as we found a sign pointing us down an alleyway which brought us to the Romsey Purbani a small Indian restaurant that is decorated in a fresh neo-modern style. The owner Mohammad is on hand with his brother to greet guest as they arrive and make them feel at home. We were shown to our table and seated in a semi-circle booth that was quite comfortable with shades of blue ambient lighting. We ordered drinks and our main courses. I had the mixed Lamb and chicken Shishlik and Mike ordered the Chicken Shishlik. With the meal, we ordered Aloo Gobi (Potato and cauliflower curry), rice and Naan bread. 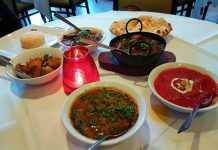 Eating in an Indian restaurant in the UK can cause some real stress especially if you are not familiar with the food, like Chinese restaurants in the West they have adjusted menus to cater to the English style of cuisine and taste. One finds themselves always ordering the same dish and not ‘getting experimental’ enough to try some of the other dishes. Maybe this comes from language barriers or impatient Indian restaurant owners (yes, there are lots of them) who just palm you off with anything. 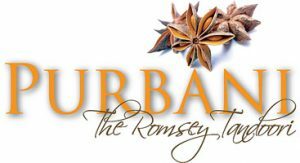 This is not the case with the Romsey Purbani who are very helpful with the menu and advice on its various Indian regional dishes. 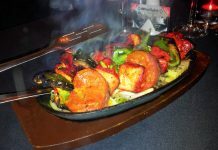 Our food arrived sizzling as a good Shishlik should with a variety of colours that made our mouths water immediately. The chicken and lamb on both our dishes was tender and cooked to perfection. If there was a benchmark to measure this restaurant then only the Starlight in Christchurch comes to mind. Everything we ate and that was served was enjoyable and had the subtle fragrance and taste that only a true Indian chef could serve. This is one restaurant that takes pride in its food and it’s no wonder they have been there 18 years. We enjoyed our meal and the hospitality that Mohammad extended to us and all of his guests. The only point of criticism came with the dessert menu. The menu items of classic Indian sweets was tainted with prefab photos immediately telling us that this was pre-packaged desserts and not homemade or freshly prepared. It’s a pity really as we have seen this often lately even with good restaurants such as the Romsey Purbani. We both wanted Banana fritters with ice cream and cashews, a wonderful Indian dish when you can find it. Maybe, it’s the time it takes to prepare these dishes that has swayed restaurant owners to forego freshly made desserts. A good solution then would be to offer at least one classic dessert that is freshly made; this would be a compromise we all could live with and especially if it came from these wonderful kitchens in Romsey. Unfortunately, I didn’t get any good photos of the restaurant as the battery was not charged and the images came out a little blurry. I would recommend this restaurant to anyone who enjoys a good Indian meal with a cold Kingfisher beer.